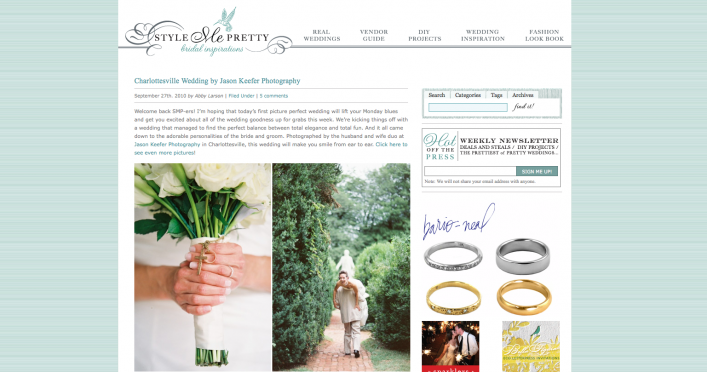 We are so thrilled that Keri and John’s beautiful wedding is featured this morning on Style Me Pretty! Jason and I met this lovely couple in 2007. Keri was a bridesmaid at another wedding that we had photographed at Ash Lawn-Highland. We really hit it off with them, and we were so thrilled when they contacted us earlier this year to tell us that they were engaged and that they wanted us to photograph their wedding! They completely flattered us by their willingness to work around our schedule and requested a list of all of our available summer dates! They both live and work in Baltimore, MD, John a nephrologist and Keri an epidemiologist. They are both extremely intelligent and have a huge affinity for knowledge, particularly history, so having their destination wedding at James Monroe’s Ash Lawn-Highland was a perfect fit! 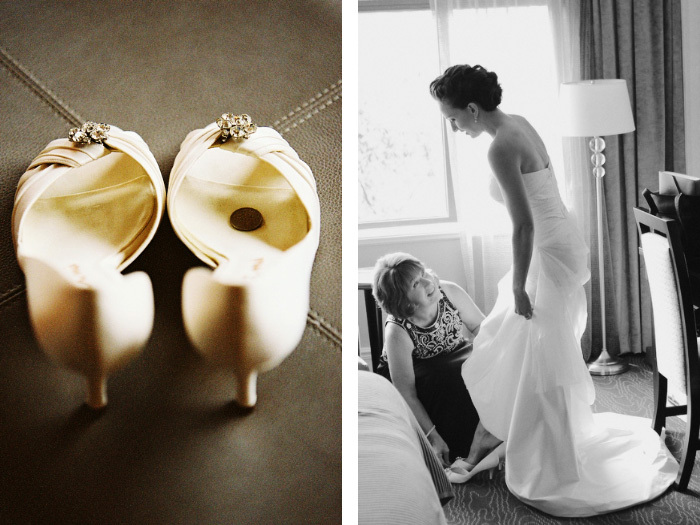 Keri has been a bridesmaid 8 times, so she had a pretty clear vision of what her day would entail. She adapted several ideas and styles and mixed them into a flavor of her own… a little bit of classic southern elegance and charm, a little whimsy, DIY and splashes of color. Keri’s clean and simple bouquet of white roses and white calla lilies were a perfect example of southern elegance and grace. The colorful lanterns hanging in the reception area were hung up by John and Keri and their families on the morning of the rehearsal. LOVE the splashes of color! The stationary and place cards were from Paper Source, but Keri added her own DIY touch by adding little jewels by the guest’s names! Keri and John utilized several of James Monroe’s lush and beautiful tucked away gardens for their first look, ceremony and lawn games. They wanted their guests (who have traveled far and wide from places like Maryland, Florida and Iowa) to be able to relax and have fun before and after the ceremony, so lawn games such as bocce ball and horse shoes were provided along with our photobooth and poloroids! Here is a list of all the wonderful wedding professionals that helped make John and Keri’s wedding weekend amazing and memorable. Jason and I have had the honor of working with most of these professionals on numerous occasions, particularly Virginia Glenn, West Main Bridal, Ran Henry, Omni Hotel, Charlottesville String Quartet and 20 South. Charlottesville is a small town, and we in the wedding community here work together often and share a wonderful bond. Lovely Rae was in charge of the photo booth festivities!